John Novacek’s major American performances have been heard in New York City’s Carnegie Hall, Lincoln Center for the Performing Arts’ Avery Fisher Hall and Alice Tully Hall, 92nd Street Y, Columbia University’s Miller Theater, Merkin Concert Hall, The Metropolitan Museum of Art and Symphony Space, Washington’s The Kennedy Center for the Performing Arts, Boston’s Symphony Hall, Chicago’s Symphony Center and Los Angeles’ Dorothy Chandler Pavilion, Hollywood Bowl and Royce Hall, while international venues include Paris’ Theatre des Champs-Elysées, Salle Gaveau and Musée du Louvre, London’s Wigmore Hall and Barbican Centre, as well as most of the major concert halls of Japan. He is also a frequent guest artist at festivals, here and abroad, including New York City’s Mostly Mozart Festival, California’s Festival Mozaic and those of Aspen, Cape Cod, Caramoor, Chautauqua, Colorado College, Great Lakes, Mendocino, Mimir, Ravinia, Seattle, SummerFest La Jolla, Wolf Trap, BBC Proms (England), Braunschweig (Germany), Lucerne, Menuhin and Verbier (Switzerland), Majorca (Spain), Sorrento (Italy), Stavanger (Norway), Toulouse (France) and Sapporo (Japan). Mr. Novacek’s current season is highlighted by his debut with the Orquesta Filarmónica de la Ciudad de México. John Novacek made his debut as soloist in the Brahms Second and took 1785 concertgoers on a wild, exciting ride. Notorious for its difficulty, both for pianist and orchestra, the concerto posed no problems for Novacek. By turns pummeling and caressing the keyboard, he entered into the lengthy discussion between piano and orchestra with ferocious good humor and infectious excitement. Novacek earned the lengthy standing ovation that rewarded his performance - he had grappled with a worthy opponent and proved himself its master. He had entered fully into Brahms’s experience of life itself and acted as a lens for its expression, ably aided and abetted by [Kevin] Rhodes and his SSO colleagues. John Novacek juxtaposes some very serious Mozart with his lighter side. He approaches all of this music with consummate control and grace and a tonal luminosity that serves the composer well. A fine recital, enhanced by excellent sonics. Novacek’s contributions cannot be exaggerated. His partnering [with violinist Leila Josefowicz] is at once brilliant and unobtrusive; without slighting any musical values, he underplays handsomely while accomplishing technical feats many pianists can’t even consider: varieties of touch, a huge dynamic range, nuances of statement and the bold use of all his pianistic resources within the parameters imposed by the genre. In terms of repertoire, performance and production values, this is a fine release. Novacek possesses a virile, steely technique that matches this material splendidly. Novacek’s style is athletic, but he is certainly capable of poetic playing when it is called for. In short, here is a splendid recital from a pianist well worth keeping an ear open for in the future. 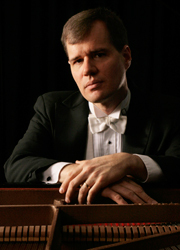 John Novacek performed Rachmaninov's Piano Concerto No. 3. Novacek’s marvelous touch was evident from the start, his flawless legato singing through the piano’s opening theme. A superb technique is required for this most difficult of the Rachmaninov concerti and Novacek displayed his fully along with his unfailing musicality, moving with ease through the concerto’s difficult passage work as well as its simpler themes. [Elliott Carter’s] Sonata was written just before he began writing five decades of the most conceptually and technically challenging repertoire that any major composer has ever put before the public. Expertly performed by pianist John Novacek, the Sonata is a glorious work, though by no means easy listening. It would make a good entry point into Carter’s musical universe. More than half the 23 rags on ‘Novarags’ are John Novacek’s original compositions or arrangements; at his best, he rivals some of William Bolcom’s superb contributions to this literature. Both the performances and the audio quality are excellent. There’s quite an emotional spectrum here, too, from the wildly irrepressible to the thoughtful and nostalgic, and that toe-tapping impulse you’ll always fine in good ragtime. There is hardly a more athletic concerto than the [Prokofiev] Third and that’s saying something. Novacek laid into the keys with a touch of radioactivity, and drove the Scotia Festival Orchestra with furious intensity, playing the syncopated chords in the second movement like a jazz pianist, triggering them off just that split second early that threatens to crack the firmament - and twisting them with gut-wrenching body language to boot. The performance on this CD by violinist Mark Fewer and pianist John Novacek is first rate. Both artists convey the versatility, intensity and dynamism inherent in Antheil’s eclectic style. Fewer and Novacek switch effortlessly from the primal pounding rhythms inspired by Stravinsky, which obviously require much stamina, to the pastiche of ragtime, vaudeville, tango, tin pan alley, fox trot and jazz. With incisive and well-muscled playing, they captivate the difficult effects required in Antheil’s compositions. The range of both instruments are pushed to the limithand clusters and glissandi on the piano, and unconventional sound effects, including arpeggiated chords played percussively behind the bridge and non-pitched scratches from the violin. For sheer virtuosity and panache, this recording is a towering achievement. Saturday’s concert offered another world premiere, John Novacek’s cello sonata called Sounding Piece. Novacek’s last movement is unusually quiet, as though [the composer] mistrusted the easy thrill of ending with a bang. Novacek’s 35-minute piece with a hectic, assertive cluster of jazzy elements was played with brio by the composer and cellist Michelle Djokic. The stinging dissonances were refreshing, and the hymn-like final movement left in its wake a shared silence as beautiful as any music. The Mimir Chamber Music Festival pretty reliably warrants a place in The News’ list of the year’s top 10 classical concerts. Thursday night’s all-Beethoven program has to be a shoo-in for 2012. Novacek didn’t let a note go by on auto-pilot. The piano darted in and out of the ensemble, rose in passion and receded in deference, all to apt effect. There was plenty of playfulness, yet authority where called for. The duo carried off this London recital with huge panache and professional energy. Theirs has become a seasoned and secure musical partnership; their ways of working together are now completely attuned. [Leila Josefowicz] has the freedom to be impulsive, explosive, coquettish, to go anywhere. [John Novacek] can support, change the backdrop, challenge and provoke her. It was a compelling performance from first note to last. © Parker Artists. All Rights Reserved.